These are some postings or correspondence regarding some area efforts. Please forward any additional information or updates to info@MissionHuntsville.org and we will include or update here as a community resource. Thank you! Blog created after the Tornado Disaster in Alabama to provide info to people who would like to support the cause. Please see links for info on churches and organizations who are offering assistance to families across Alabama. By following the website links, you will find more info on how you can donate and volunteer... plus drop sites for water, food, clothing, etc. Please see the list of suggested items for collection. So many organizations and associations are getting involved and mobilizing their efforts and resources to help the affected communities. To find out more & to stay up to date on the progress of relief efforts, go to http://al.com/. All volunteers must register by calling: 2-1-1 (in-state), toll-free: 888-421-1266, or online at http://servealabama.gov/. Thank you for whatever you can do to help. You can email "Alabama Disaster Relief Info" at alabama.relief.info@gmail.com. Madison County Sheriffs Chaplains need volunteers to help with Disaster Relief. If you can help respond to this email or call 256-509-9755. Beginning on Monday night, June 6 … From 7:00 - 8:30 at Good Shepherd UMC The Vine Pastoral Counseling Center is going to off a "grief support" ministry consisting of support group, individual pastoral care and professional trauma counseling for survivors of the recent tornados. This will continue every Monday night as long as there is a need. They have fliers that we would love for volunteer work crews to take and put in the hands of survivors as they are doing debris removal. Also, they are coordinating a team of Stephen Ministers, pastors, chaplains and other professional counselors who can help with the effort. If you are a pastor or minister, they would welcome you. There will be a training on Thursday night, May 26, 7:00-9:00 in the parlor at First Baptist Church, Huntsville to share important information about emotional and spiritual care after a disaster as well as to coordinate about how to deliver this ministry together. Please call 256-461-8580 to sign up for the training or to express your interest if you cannot attend the training. The Presbyterian Disaster Assistance program has excellent information about the stages of recovery. It appears that our community and the survivors may be about to enter a stage of "disillusionment". The Vine is preparing to be there for the long haul to give people a place to talk, to regroup and to connect with others. Can we bring a drop a hope? They would appreciate your help and your prayers for this ministry. If you had tornado damage to your home, loss of food, expenses related to protecting your home, or lost income as a result of the disaster and you meet the income limits composed of net household income plus available liquid resources (cash or money in the bank), you may qualify for a financial recovery program made possible by the Alabama Department of Human Resources (DHR) and the U.S. Department of Agriculture. DHR has received approval from the USDA and the Food and Nutrition Service (FNS) to operate a Disaster Supplemental Nutrition Assistance Program (D-SNAP), a program designed to provide benefits to people who might not ordinarily qualify for the Food Assistance Program. To qualify for the benefits, residents must apply in person or have an authorized representative apply for them. See the attached file for complete details, including the application schedule, times and location for your affected county. Applications will be accepted Tuesday, May 17th through Sunday - six (6) days only to apply!! You must apply on the designated date, according to the first letter of your last name. For Madison County residents, Sunday, May 22nd is the only make-up day if you miss your assigned application date. Please read all criteria carefully and comply as indicated. Remember, this program is for persons who would not normally qualify for food assistance programs. If you are unable to open the attachment, please reply back to request a different format. - Tree Removal – FREE Service from United Way: If anyone needs any help removing trees that came down from the storm, please call United Way. They will come out and remove the trees for FREE. They are trying to get the word out to everyone so if you know of anyone who has this need, please let them know to call United Way. Their number is 256-536-0745, ask to speak with someone about tree removal. UMCOR (United Methodist Committee on Relief) – Good Shepherd United Methodist Church (corner of Old Railroad Bed Road & Capshaw Road) is the designated Red Cross Emergency Shelter. From the excellent United Methodist Committee on Relief's UMCOR training of over 100 persons at Asbury United Methodist Church last Saturday 05/07 we have learned: It is critical that the 75% average non-response rate of persons ELIGIBLE for FEMA benefits after disasters be decreased significantly. Persons who have been directly impacted by the disaster need to fill out FEMA forms by June 26th to be eligible for benefits. The forms themselves are confusing in that the letterhead reads Small Business Administration or SBA and one has to read further down to catch the association with FEMA benefits. THIS is the ONE form that must be filled in within 60 days (now 50 days remaining) by June 26th for benefits to rebuild a home, relocate, pay for funeral expenses, pay for medical/dental expenses, etc. and other necessity needs. If this form is not filled out within 60 days of the disaster; the survivor and family is INELIGIBLE for Federal help of any FEMA kind. This help comes through the financial branch of FEMA which is the SBA and many people must communicate this accurate information to others and help them to respond quickly. Time is completely of the essence. The FEMA forms can be found online by going to http://www.fema.gov/assistance/index.shtm or call 800-321-3362) or stop by the FEMA office at the Monrovia Church of Christ on Capshaw and Nance Roads and fill out a hard copy. 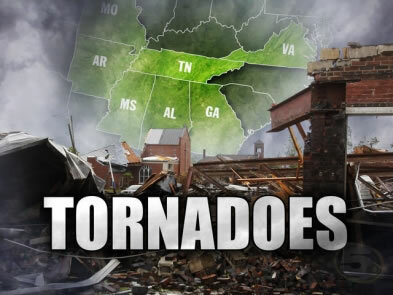 Members of the public can report fraud involving the tornado relief through the National Center for Disaster Fraud (NCDF) Disaster Fraud Hotline at 1-866-720-5721, the Disaster Fraud Fax at 225-334-4707, or the Disaster Fraud e-mail at disaster@leo.gov. The hotline also has a Spanish option. In response to a significant amount of fraud associated with federal disaster relief programs that went into effect following Hurricanes Katrina, Rita, and Wilma, a Joint Command Center was established in Baton Rouge in 2005. The command center, now known as the National Center for Disaster Fraud (NCDF), has received and screened more than 41,000 complaints of disaster fraud and referred nearly 26,000 of those to law enforcement for investigation. The NCDF—based on its extensive expertise and established infrastructure—has helped victims of fraud related to Hurricanes Katrina, Rita, Wilma, Ike, and Gustav, as well as those affected by severe storms in more than 20 different states, earthquakes, tsunamis, and wildfires. Kelley Javinett from Tarrant City Schools was kind enough to send me the following information on a group called "Alabama's Lost Birthdays". This is a possible resource for families affected by the tornadoes. Please feel free to share. · Harvest Youth Club will have a needs list on the Harvest Youth Club web page: http://www.harvestyouthclub.com/. · Need Van transportation for at least two weeks -2 vans or one 15 passenger (they have a driver, but their van was damaged in the tornado). HYC is concentrating on the Adopt- A- Family program during the Recovery phase. They are asking churches, Groups to sign-up to adopt a Family. Sister LaFreeda Jordan in Senator Shelby’s office provided the attached FEMA News Release (PDF) for your information. This information is very valuable! Also, on Senator Shelby’s webpage we have additional resources listed under Tornado assistance. www.shelby.senate.gov Please encourage who need assistance to register! The Board of Trustees and staff of the EyeSight Foundation of Alabama extend our heartfelt sympathy for those who suffered losses of loved ones, homes and businesses in the recent severe weather outbreaks across Alabama. We have set aside an emergency fund to assist with storm-related eye care needs, such as treatment of eye injuries, replacement or repair of eye glasses, loss of contact lenses, refill of prescription eye drops, etc. These funds will be made available to qualified non-profit organizations who can provide and/or coordinate such services. For more information, please contact Shirley Hamilton or Torrey DeKeyser at the EyeSight Foundation office: 205.488.0771. “If you are a storm victim who rents a residential home, trailer, mobile home, or apartment that was destroyed or damaged by the recent severe weather, please note that under Alabama’s Uniform Landlord Tenant Act you may still be liable for rent if you don't terminate your lease pursuant to Ala. Code (1975) § 35-9A-406. Under section 406 tenants only have 14 days from the casualty (or date of vacating the premises) to notify their landlord in writing that they are terminating the lease. Fourteen (14) days from the April 27, 2011 tornados is May 11, 2011. The Alabama Department of Revenue has announced the granting of automatic filing extensions for any Alabama tax return and state-administered local tax return to storm victims located in 38 Alabama counties struck by the severe storms and tornadoes that occurred beginning April 15, 2011. Affected taxpayers have until June 30, 2011, to file any Alabama tax return and state-administered local tax return that would have been due on or after April 15, 2011, and on or before June 30, 2011, without being subject to penalties and discount losses. Alabama's tax laws have no provision for the waiver of interest; however, late payment penalties will be waived for the affected taxpayers. Please communicate this information to congregations and individuals who want to help in this massive effort. On behalf of Dr. Wayne Snodgrass, the GHIMF member congregations and other houses of worship – thank you in advance for your consideration of our request for helping hands and helping hearts!